It was silly, it said about stinky feet and stuff. Awesome set of books!! A little book for each emotion in a slightly encouraged order: Joy, Sadness, Anger, Disgust, Fear (then back to Joy). So refreshing to have character consistency in Disney paraphernalia. And these books display the best of Inside Out characters' existence! Short, with all the personality of the emotions, funny, fun to read, and subtly exploring the differences and strengths between emotions without preferring one. Though my daughter prefers Disgust, and I'm not sure I'm cool with that. :) Oh, my kids really like them, too!! Well done! This boxed set begins with JOY, who is happy about everything, even the rain. SADNESS thinks her toe was stepped on and the only reason she likes rain is because it makes you shivery and droopy. ANGER certainly doesn’t like broccoli on pizza. That just leads to DISGUST who hates stinky thinks and spiders. Well FEAR wants nothing to do with spiders or other scary things. But then JOY tells him those hippos on the nature show are so cute! 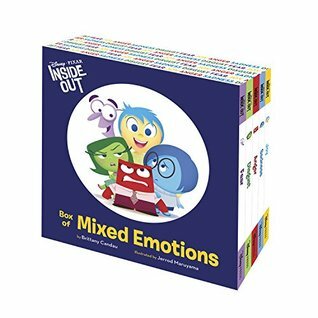 This box of emotions reveals in simple bold text and bright basic colors the many feelings young children may experience but need help understanding. Great little boxed set. My kids love the little books and they're a great tool for getting kids to talk about their emotions (a feat with young ones who have trouble articulating that sort of thing). I wish there was a bit more substance to them, though. There's no story and they're so short that there's not a whole lot to work from. Makes a great quick book when you don't have much time or when the kids want "just one more" book. So much emotion in one tiny box! In this little box set you will find five books-one from each emotion: Joy, Sadness, Anger, Disgust & Fear. I love this set, because you can do different voices while reading with your child. I'll admit I even cracked up reading it to myself...Enjoy! We got an early review copy of this set and my kids are LOVING it! They beg to read it non-stop. The box and books are quality material too, so I like that it won't get easily beat up!